Courtesy of the White House Historical Association. Inheriting New England’s strongest traditions, Abigail Smith was born in 1744 at Weymouth, Massachusetts. On her mother’s side she was descended from the Quincys, a family of great prestige in the colony; her father and other forebears were Congregational ministers, leaders in a society that held its clergy in high esteem. In 1784, she joined him at his diplomatic post in Paris, and observed with interest the manners of the French. After 1785, she filled the difficult role of wife of the first United States Minister to Great Britain, and did so with dignity and tact. They returned happily in 1788 to Massachusetts and the handsome house they had just acquired in Braintree, later called Quincy, home for the rest of their lives. When John Adams was elected President, she continued a formal pattern of entertaining—even in the primitive conditions she found at the new capital in November 1800. The city was a wilderness, the President’s House far from completion. 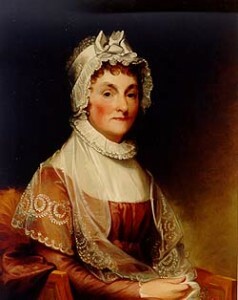 Her private complaints to her family provide blunt accounts of both, but for her three months in Washington she duly held her dinners and receptions.